Mort Künstler Handsigned & Numbered Limited Edition Artist Proof Print:"Jackson's Foot Cavalry"
Size : Image Size: 18" x 27" / Overall Size: 23" x 31"
Edition: Artist Signed and Numbered AP on paper and Canvas Editions /50/50/15/ (Select Option Above). About the Edition: None could outmarch them. Some believed none could outfight them. They were known as ?Jackson?s Foot Cavalry? ? so called for their ability to cover more than 30 miles a day ? cavalry distance ? on the march. Virginians all, they formed a division of troops under the command of General Thomas J. ?Stonewall? Jackson in the Shenandoah Valley of Virginia in 1862. In March of 1862, they numbered about 10,000 and had orders to defend the Valley from Northern forces four times their size. General Nathaniel Banks and 40,000 Federal troops had been moved into the Valley to battle Jackson while General George B. McClellan moved his giant Federal army toward the Confederate capital of Richmond. After driving away Jackson?s force, Banks was supposed to withdraw toward Washington, D.C. and support McClellan?s army as needed. Initially, Banks? army pursued Jackson southward through the Valley. 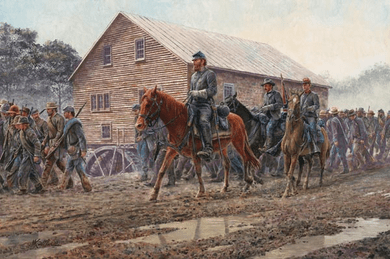 Believing Jackson had been driven away, Banks left General James Shields and a division of troops near Winchester, Virginia, and began to move the rest of his army toward Richmond as planned. Jackson, however, led his ?foot cavalry? army in a rapid forced march back through the Valley, and struck Shields a surprise blow at the battle of Kernstown on March 23. Although Shields? larger force eventually prevailed, Jackson won a strategic victory by keeping Northern forces tied down in the Valley. Reinforced by 7,000 more troops, he soon attacked again, this time defeating Federal forces under Generals Robert Schenk and Robert Milroy at the battle of McDowell on May 8. At Front Royal on May 23, he attacked Banks, forced him to retreat to Winchester, then decisively defeated him. Banks made a hasty retreat back north and across the Potomac River. In response, Washington authorities moved a large Federal force into the Shenandoah Valley to punish Jackson. It was not to be. Stonewall had lived in the Valley and he knew the country intimately. His ?Foot Cavalry? was already moving by late May, and Jackson escaped a trap set for him near Strasburg. What then unfolded was one of the most brilliant operations of the Civil War: Stonewall Jackson?s Valley Campaign. Although threatened by superior Northern forces on two sides, Jackson defeated General John C. Fremont at Cross Keys on June 7, and General James Shields at Port Republic on June 9. Both Federal armies retreated. Meanwhile, General Robert E. Lee turned back McClellan?s army in the Seven Days Campaign. Lee had saved Richmond, and Jackson was master of the Valley. In 38 days, his ?Foot Cavalry? marched approximately 400 miles, engaged in six battles, defeated five Northern generals and prevented thousands of Northern reinforcements from attacking Richmond. Jackson and his ?Foot Cavalry? had become the stuff of legend. I have never tired of painting General Stonewall Jackson. He was such a remarkable commander, such a fascinating man, and he did so much that I will never run short of extraordinary exploits to paint. Each painting has its own distinctive challenges, and offers its own set of opportunities. I?ve painted scenes from his brilliant Valley Campaign on several occasions, but I really wanted to paint a study of his famous ?Foot Cavalry? with Jackson at their center. Being able to use the scenery of Virginia?s Shenandoah Valley as a backdrop is always a bonus ? and especially in this picture. There?s a wonderfully picturesque old gristmill near Strasburg, Virginia ? now preserved as an inn and restaurant called the Old Mill Tavern. Jackson and his ?Foot Calvary? marched by it during Jackson?s Valley Campaign. What better background for Jackson and his soldiers than this wonderful old historical landmark? To make certain that this painting was distinctive from any other work I?ve done of Jackson, I painted an entirely new angle for Jackson and his mount ?Little Sorrel.? Stonewall Jackson, ?Little Sorrel? and the old gristmill made a perfect combination. In fact, you can drive by Old Mill Tavern in Strasburg, and you?ll recognize the view from the Old Valley Pike ? the same pike used by Jackson and his ?Foot Cavalry.? The date of the painting provided a unique color scheme. For almost a week prior to May 31, 1862, the weather had been rainy. This actually allowed me the opportunity to use a different color scheme than anything I?ve painted with Jackson in the past. The final piece of the puzzle was how to depict the army. Jackson?s famous ?Foot Cavalry? was a colorful mix of young boys in ill-fitting uniforms and savvy veterans ? all understandably road-worn from their incredible forced marches. At Strasburg, where they?re here depicted, they escaped a Northern trap ? to survive, achieve victory in Jackson?s ?Valley Campaign? and earn a level of fame unsurpassed by any troops on either side in the Civil War. They and their commander were quite extraordinary ? and they made fascinating subjects for me.